Home > Information for Children & Young People > What is Child Abuse? There is a lot of advice and help for young people about staying safe both out & about and online. Below are a few websites with information that you might find helpful to find out about staying safe. 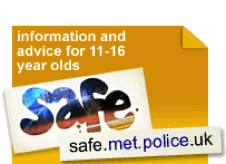 SAFE - a website from the Metropolitan Police Service dedicated to young people. The Metropolitan Police Service have launched a Safe website aimed at 11 to 16 year olds, providing advice and information about crime and safety issues. Click on the picture below to visit the SAFE website. If you have information about a crime but dont want to talk to the police, the charity Fearless allows you to pass on information 100% anonymously using a secure online form. Click on the picture below to visit the Fearless website. This is a 24-hour helpline offering information and advice to anybody concerned about drugs and substance misuse. Click on the picture below to visit the TALKTOFRANK website. Whether you want to know about contraception and STIs, healthy relationships or more about staying healthy and happy we will either be able to give you the information or point you in the right direction. Click on the picture below to visit the Brook website. If you’ve run away, been forced to leave home, are thinking about it or are worried about someone the runaway helpline are there for you. Click on the picture below to visit the Runaway Helpline website. If you've been a victim of any crime or have been affected by a crime committed against someone you know, vitim support can help you find the strength to deal with what you've been through. Click on the picture below to visit the Victim Support website. Young Minds offer information to young people and children about mental health and emotional wellbeing. Click on the picture below to visit the Young Minds website.